On September 1st I posted a quilty "to do" list, and I'm happy to say I ticked a few things off this month. I'll have a picture or two of the new Wandering Geese soon. We're taking it for a walk in the park for glamour shots (or my attempt at them) tomorrow. I wrote posts about the butterfly, Sparkling Trail and Samoyed earlier this month. I made good progress on Star Fall, a new design. It still need background strips on either side, then I need to decide: border or no borders? My original idea was to skip borders and just bind in scrappy print leftovers. Now I'm not sure. It will have to simmer a little bit. In the meantime, I've been working on figuring out the details of making these Lemoyne Stars without the Rapid Fire Lemoyne Star ruler. 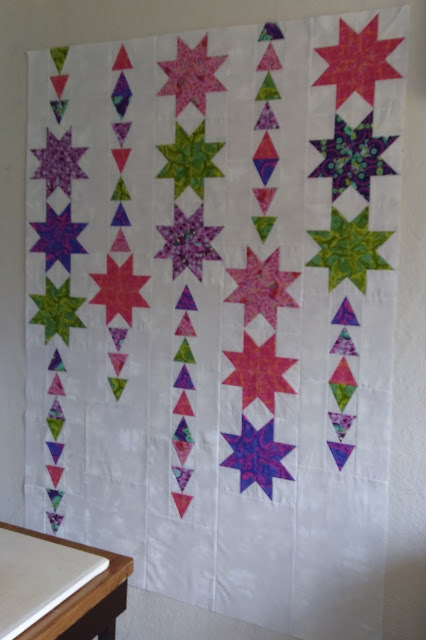 As much as I loved using Deb Tucker's ruler to make the stars and the triangles, I fear a pattern requiring two specialty rulers might be challenging to sell. I plan to include instructions for using the rulers, but also instructions without. Today I worked on trimming details. I had previously printed out templates from EQ7 to measure the pieces. I then worked out how to measure to rotary cut the pieces without the templates. 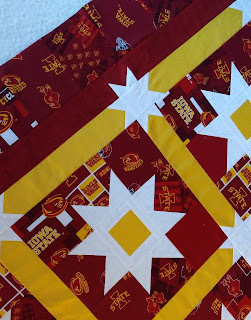 What I needed next was help aligning the pieces, so I cut out paper pieces, drew in 1/4" seam allowances all around, and put pins through the seam intersections, matching the intersections of two pieces the way they would be when sewn. With the pins holding those matched points together, I could mark where one piece extended past the other piece. That's the trim line for that piece. I trimmed the paper as marked, then pulled out my handy dandy Marti Michell corner trimmer to see if it would trim the same way. Yes! That made things so much easier when I switched to fabric! Trimming the tips just so lets me line up the pieces with no guesswork and no marking of each individual fabric patch. I got impatient to see if all my figuring worked and neglected to take progress pictures. Here's the finished test star block though. I'm going to try to remake the quilt in different fabrics using these measurements, without the specialty ruler. If that works, I'll move on to writing up the pattern both ways. Or maybe three ways. 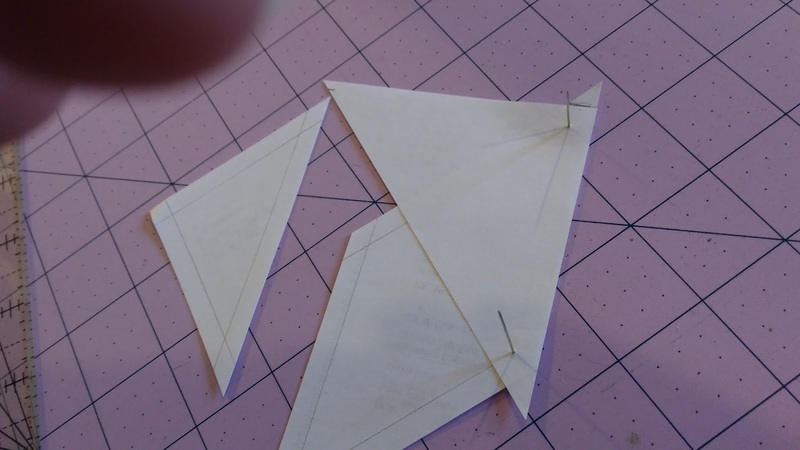 Paper piecing would be easy and accurate, so I could make it that way too. 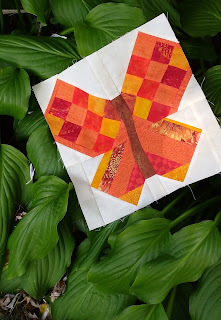 I do hear a lot of people say they won't touch paper piecing though and I don't want to limit the pattern's appeal....Clearly, I have a lot of thinking still to do! While I think, I'll cut fabric for method two. 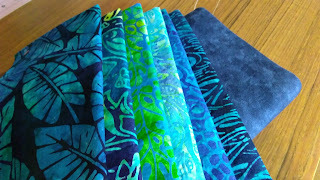 Here's what I spent a couple of hours choosing for it at the quilt shop a few weeks ago. Hmm. That's not a great picture. There's a pop of yellow in the second fabric, and the last fabric, which will be background, is deeper and richer that it appears in the photo. I guess I need to step away from the computer and go cut the fabric in all its glorious batik color so I can put it all in a top to show it off properly! Today was the first day of fall, even though you wouldn't have guessed it from the heat and humidity! Still, the changing calendar made me think of pulling out my fall quilts. I only have those out until early December, when Christmas quilts get their turn, so I need to pull them out now to enjoy them for a few months. I thought I'd share one of those for my second Blogger's Quilt Festival entry. Here is Autumn Moons, finished in August 2013 but still one of my favourites. I was practicing curves and had to do something with those practice blocks! 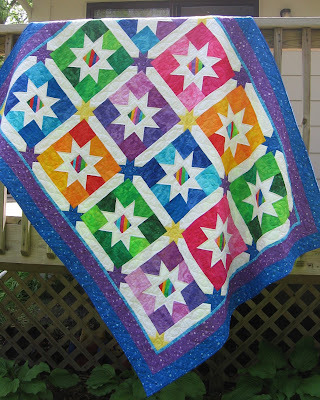 I hope you will pop over to the Blogger's Quilt Festival to be inspired by all the quilts. It's quite a collection of all sizes, styles and colors! 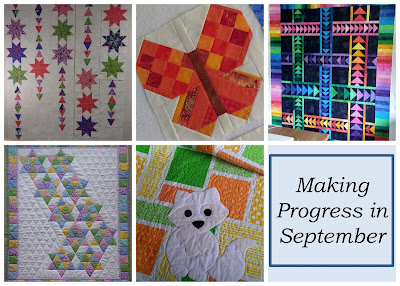 Amy at Amy's Creative Side is hosting the Blogger's Quilt Festival again. This year she has gone back to basics, with no categories and no voting, just a chance to be inspired by oodles of beautiful quilts of all sizes and styles. I'm a little last minute with my contribution, as I couldn't decide what to share. I've been working on quilting a new Wandering Geese all week, and I thought it might be fun to share the new version as the original was one of my early Blogger's Quilt Festival entries. 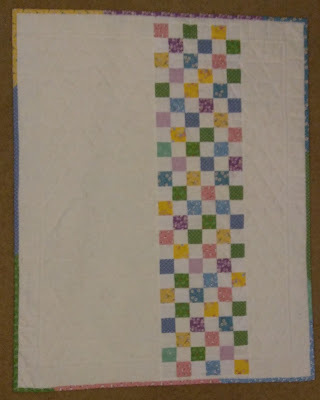 However, the quilting isn't finished so I chose my most recent finish instead. Sparkling Trail in 1930's fabric had been sitting in a bin, unquilted, since February 2015. I really like how the top turned out, so why was it languishing in a bin? When I pulled it out this August to show different color options in my trunk show, I felt bad showing just a flimsy. I didn't have time then to finish it properly but it moved up a few places on my priority list! 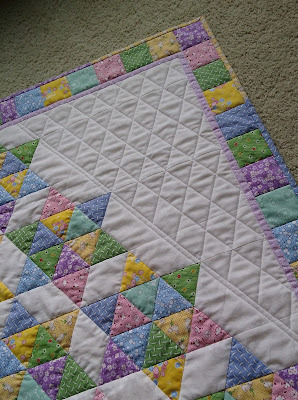 I think this sat unquilted for so long because I just couldn't quite decide how to quilt it. I have quilted every version of Sparkling Trails differently (you can see those here, here and here). I thought I should do some free motion swirls or feathers on this one, but I just couldn't work up the enthusiasm to do that. 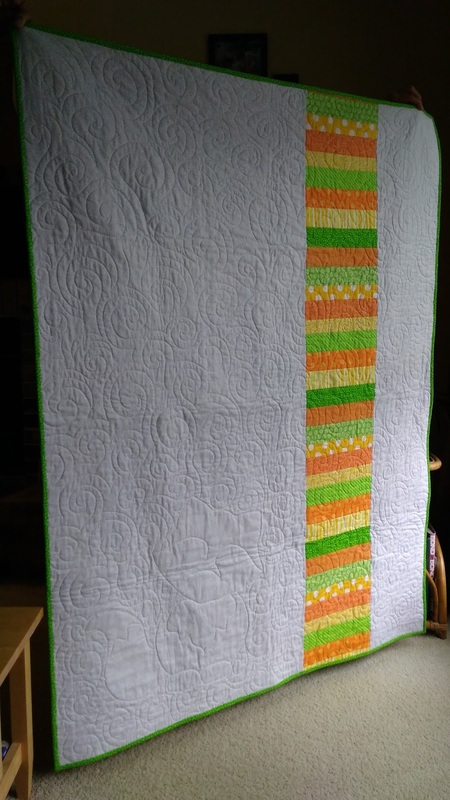 When I presented my trunk show this summer, I realized that most of my quits are quilted mostly with a walking foot (some have a few FMQ flourishes added in) and the audience really liked what I had done. It reminded me that there's nothing wrong with straight line quilting. As long as it enhances the piecing, it doesn't matter if I used FMQ or a walking foot, especially it it gets me a finished quilt! So, out came the flimsy, the walking foot and my hera marker to mark some straight lines. 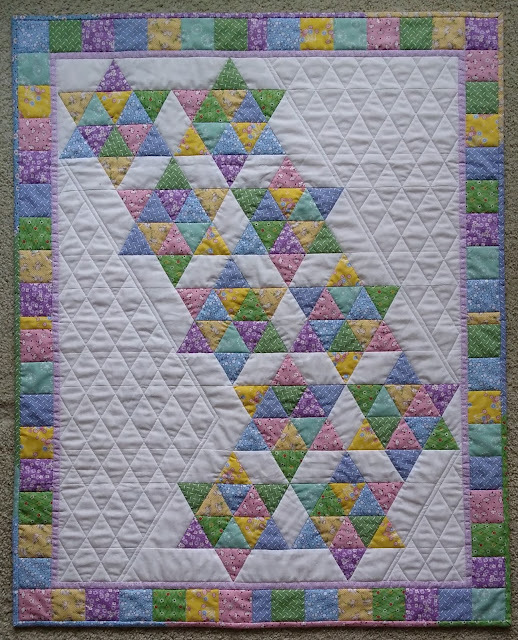 I quilted in the ditch around all the triangles and borders, between the squares in the outer border, then added the diamond crosshatching. This is a mini version of Sparkling Trail, just 30" x 36", but I didn't have appropriate yardage for even such a small back, so I used some scraps from the top to add some width. I think it turned out pretty cute. I used scraps for the binding too. I'm feeling very thrifty! I have one more version of this quilt to quilt. Maybe the black and red mini will get the swirls! It is a little lower on my list though. I have Wandering Geese to finish, a reworking of Jelly Bean Stars clamoring for me to get started, two Lemoyne Star modern quilts in progress and some Anne of Green Gables fabric I'm itching to get to. And some pattern writing to do in there somewhere. I think the black and red one will be the 2018 Sparkling Trail finish! 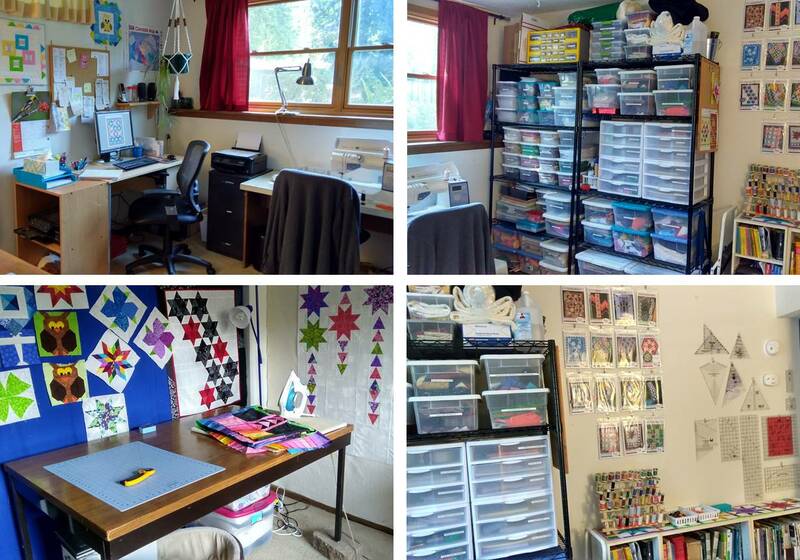 While I procrastinate (I should be basting Wandering Geese) I have tidied up my sewing room. Since it's now so tidy, I thought it might be a good time to invite you in for a tour. 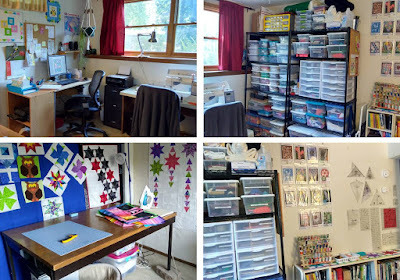 While I was thinking of that, I looked through old photos and was reminded how much my space has changed over 18 years. So this post has evolved from a tour to a peek at that evolution. First, here's where things stand now. Now let's look back to where I started. 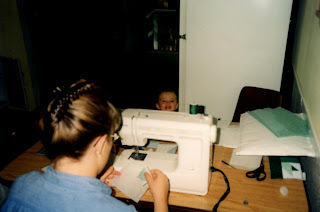 When I first started sewing in 2000, there was no sewing room. 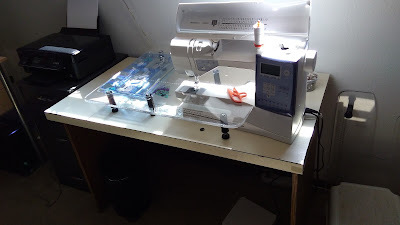 I used the kitchen table, and my machine was put away in the bedroom closet and taken back out again every time I wanted to sew. There was no stash. 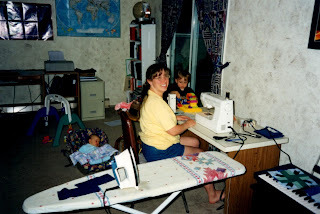 In 2002 we moved, to a smaller space, the desk was pressed into service to hold the TV and stereo, and I went back to the kitchen table/closet combo. In 2003 we moved again, and I got the sewing desk back. In 2004, we bought our house and I laid claim to a tiny corner of the playroom/family room. The kitchen table remained indispensable as my cutting station. 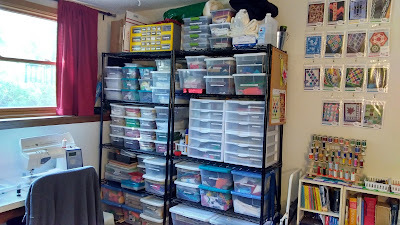 The stash came into being, filling about 2 square cubbies of the wire shelving we bought to hold the kid's toys. Then came my new sewing machine in spring 2010. It was such a joy to work on that I ramped up my sewing. Well, I guess the kids were getting older. I think that helped too! At any rate, the little corner you see below stared feeling confining. 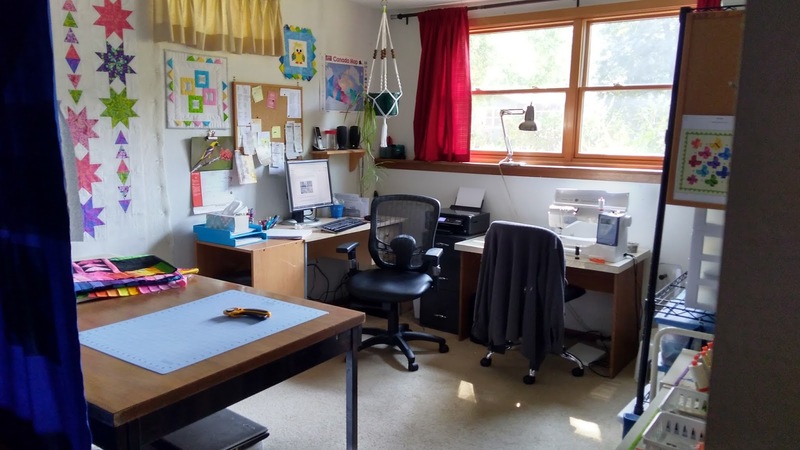 By fall, the kids being older and all, and at school most of the day, I had relegated the play area to the darker half of the room and claimed a whole half of the room as my own playroom. You can see the slowly growing stash in the wire cube shelving on the left. Things moved around. The stash started to grow, though at least half the stuff on those shelves you see below on the right belonged to the kids, not to me. All this time I was still running up and down to the stairs to cut and trim on the kitchen table. I suspect I might have been a tad healthier then. The physical fitness started going downhill when we found this great table free for the taking at the curb a few blocks from home and moved it into the sewing space. It isn't the prettiest, but it is sturdy and it makes a great cutting table. Besides switching the position of the computer desk and sewing desk, nothing changed (except the growth of the stash and the addition of a dog bed under the table for my faithful quilter's companion) until this past March when I was informed that I should close the room off somehow so the kids (now well into their teens) would not feel so much like they were watching movies in my office/studio. I have an office? A studio? OK! That brings us to the lovely blue wall currently behind my cutting table. After much discussion of how to hang a quilt as a divider, or maybe curtains, I settled on fabric pinned to the box that encloses the duct work in the basement ceiling. It was cheap, easy to put up, and gives me a place to display orphan blocks and small unquilted tops to remind me to quilt them. Plus, when I get tired of the blue, or I manage to claim the entire downstairs, I get to add it to the stash! The newest addition to the room cost less than $10 and is one of those things I should have done years ago. I can't believe it took me so long to get around to it. My husband and daughter drove to the home improvement center (daughter has just started driving and finds any errand is a good excuse to get behind the wheel) just to get 4 landscape pavers/bricks/slabs/what-do-you-call-them to put under the table legs. It isn't fancy, but those 5 inches of extra height have made a world of difference for my back. I didn't realize how much I had to bend, just a little, to cut and press things. And what about the stash? It outgrew the little wire cube shelving. That shelving wasn't very efficient anyway. 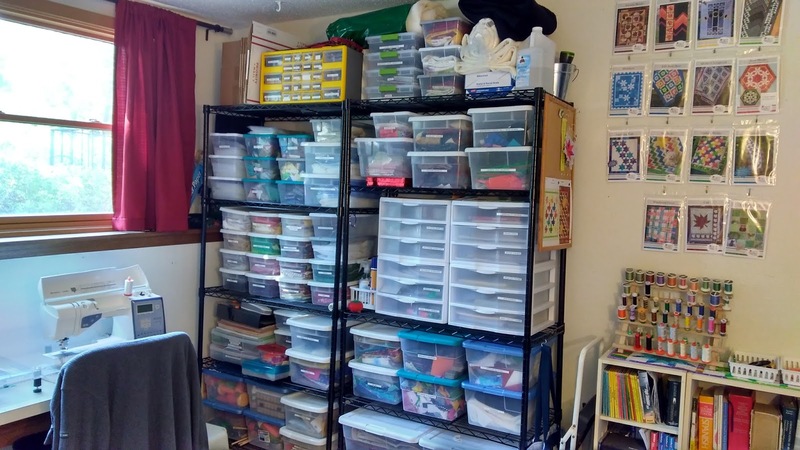 When the back-to-college sales were in full force last month, I sprang for new shelving and spent a weekend getting organized. I even managed to de-clutter under the cutting table because I could fit more on these. New shelving. Nothing is hiding anymore! Can I say I love my label maker? Because you just can't be sure what colour is in those clear bins unless they are clearly labelled! 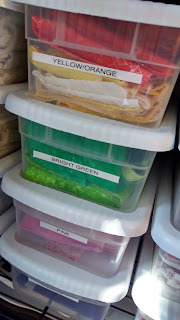 I did label the less obvious bins too, with project names for example. 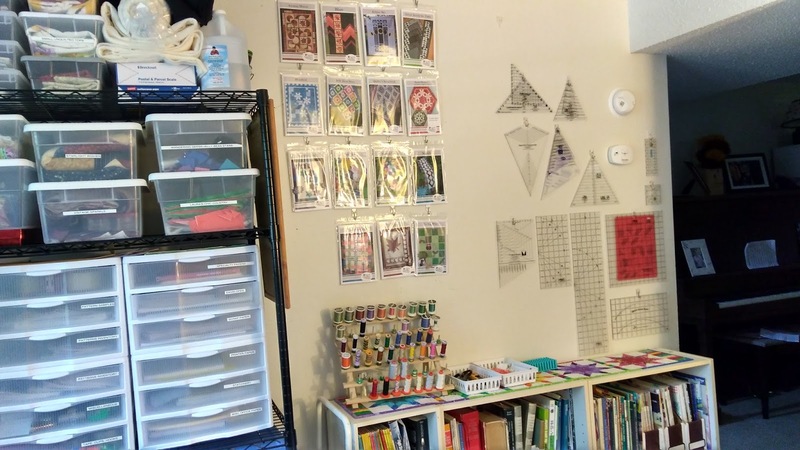 I also hung all my ruler on the wall. Most are hanging from 3M Command hooks that can be removed and repositioned easily if I need to rearrange to make room for new rulers. A couple are hanging on nails because the hooks just wouldn't stay stuck to the wall. I didn't think those rulers were heavier than the rest, but I finally gave up and reached for the hammer. And after all that, I still use that $3.00 desk that Carol found for me. I would love a sewing cabinet with the machine set into the desktop. 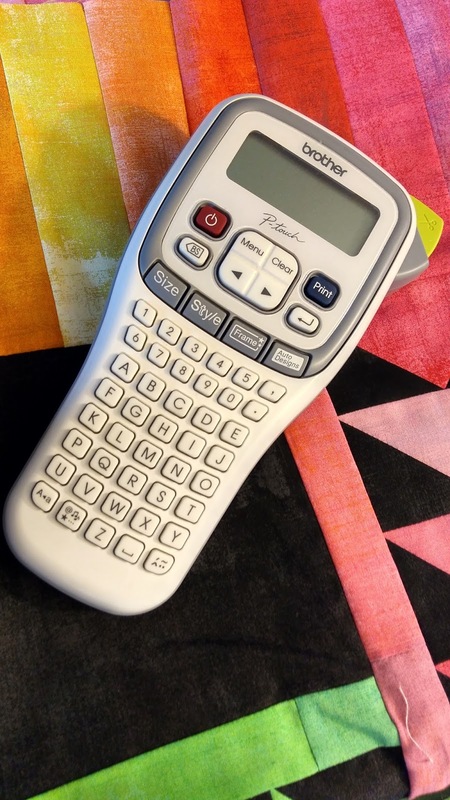 That would make a huge difference for quilting, both free motion and walking foot. However, when I eventually get one, I'll miss the stories this little desk can tell. Time to use this lovely space to baste a quilt. Wandering Geese is not basting itself, unfortunately! I didn't have as much time to sew this week as I would have liked, but I did start ticking things off the list from my last post. I didn't start in order! I struggled with this one. This is not what the wings looked like initially. I spent way too long trying to make something else work. I should have taken a picture of that too, but I was too focused on getting this done to remember pictures. Anyhow, arriving at this simpler version required careful picking and reconstructing because I didn't want to waste the background fabric that I had already trimmed for the failed version. Anyway, it's done. I think I may make a pink one next month, and call the nine butterflies enough. 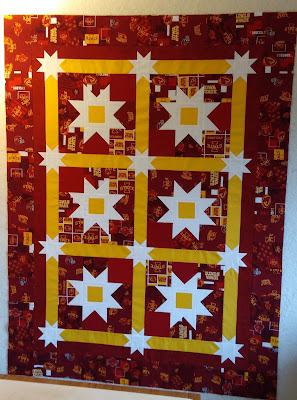 I spent some time this week playing with new layouts using just 9 instead of the anticipated 12 blocks. I may throw in a few Spring Blooms to fill in some blanks. We'll see. 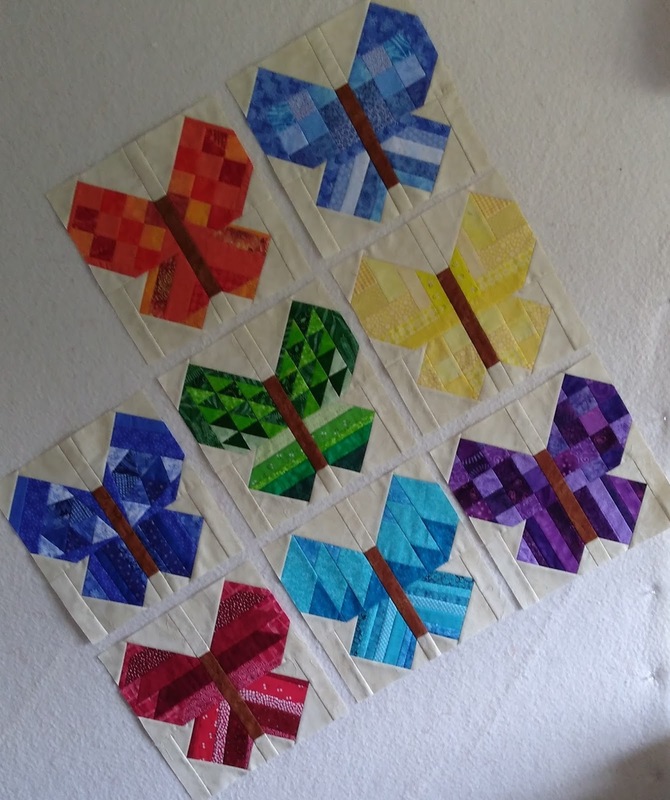 Here are all the butterflies so far. 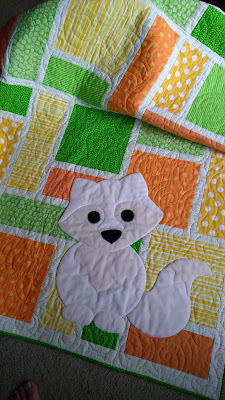 Next, I finished the binding on the Samoyed baby quilt. Hubby delivered it this week and says it was well received. Good, because they almost didn't get it. I kind of wanted to keep this one! I even like the back. I needed just 10 inches more than the width of fabric for the backing but I really didn't want a lot of extra of this fabric in my stash. Enter the scraps from the top! Then, instead of finishing something, as in quilting one of the four unquilted tops on the list, I started something new, but it was on the list so it's OK, right? 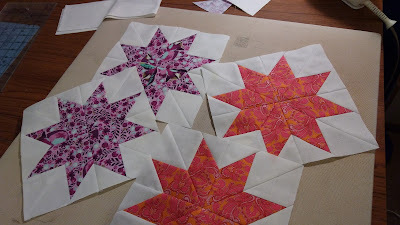 These Lemoyne Star blocks came together quickly using the Rapid Fire Lemoyne Star ruler from Studio180 Designs. I spent a long time not wanting to spend money on rulers if it was at all possible to make the block without the specialty ruler. I caved on this one. I can and have made it without the ruler. This just made it so much faster and the points are all just where they should be. I have made a few more, and some alternate blocks as well. I can share the finished top soon. If I get off the computer now, I can probably have all the blocks together into a top by bedtime. But first, supper! I have to be fueled up for sewing. 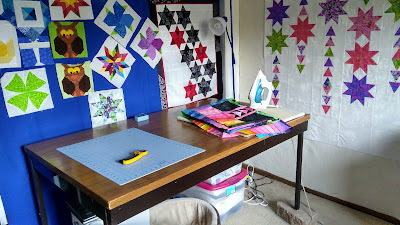 When I sewed new samples for my trunk show last month, Jelly Bean Stars was one of the quilts I needed to remake, because I had given away the original. I played with a few little details. Here's the original. I made fewer blocks for the new sample, partly to see how it looks in baby-size, partly because I was short on time, and partly because that's all the ISU fabric I had and I wasn't making another trip to the shop (see the part about time). I'm sure you can spot the design differences. 1. There is a more unified color scheme. 2. Small stars in the sashing match the color of the larger stars. 4. Small star points extend into the border. I love the way those small stars pop now! My husband looked at both pictures and was convinced that I had changed the proportions of that small star somehow. He thought the original quilt had an X at each cornerstone rather than a star. I think the reason is that, against the white sashing, the colored cornerstones looked like extensions of the colors in the blocks. Also, the large stars are pretty strong. Making the small ones the same color helps visually pull them forward a bit. 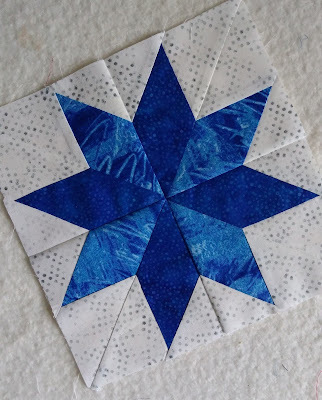 Extending the small star points helps with the pop too, and is just more visually interesting, I think, than cutting them off at the inner border. It wasn't even very hard to do, so it was definitely worth the little bit of extra piecing. 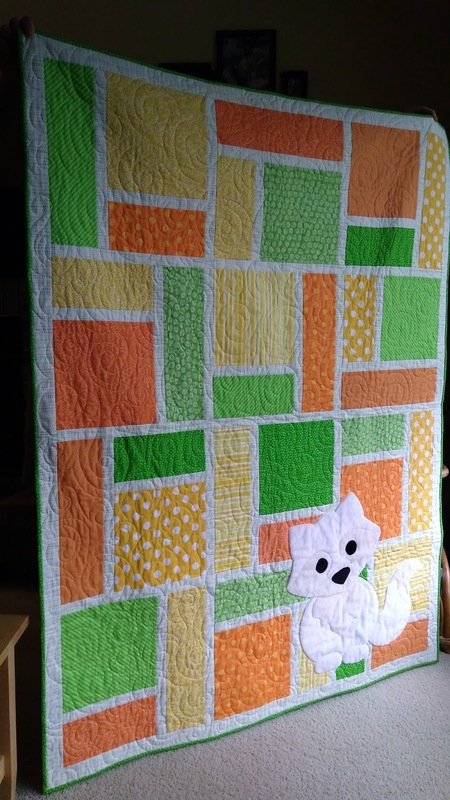 I still love the original quilt. How could I not, with all those beautiful bright colours? I have leftover fabric from remaking Wandering Geese and had planned to make another Jelly Bean Stars with them, just as the original was made with leftovers from the original Wandering Geese. Here are the two together. Now I am wondering if I can tweak this colorful version a bit. I definitely want to extend the small star points into the border. I think I would also like to make those small stars white, like in the Cyclone baby version, but then I'd have to choose a different color for the sashing and I'm stumped. 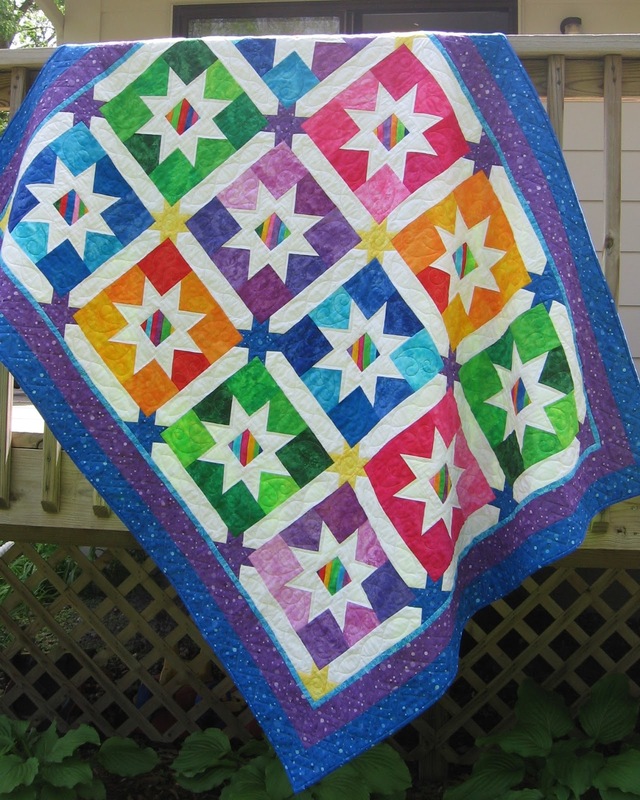 What would go well between any of the color combinations and still let the small stars pop?